"Perseverance Valley," on the rim of Endurance Crater, includes wheel tracks from the Opportunity Mars rover's descent of the valley to investigate its origin. The rover's Pancam took component images in September and October of 2017 for this approximately true-color scene. Credits: NASA/JPL-Caltech/Cornell Univ./Arizona State Univ. Late-afternoon shadows include one cast by the rover itself in this look toward the floor of Endeavour Crater by NASA's Mars Exploration Rover Opportunity. The rover's Navcam recorded the three component images on Nov. 11, 2017, about a week before Opportunity's eighth Martian winter solstice. 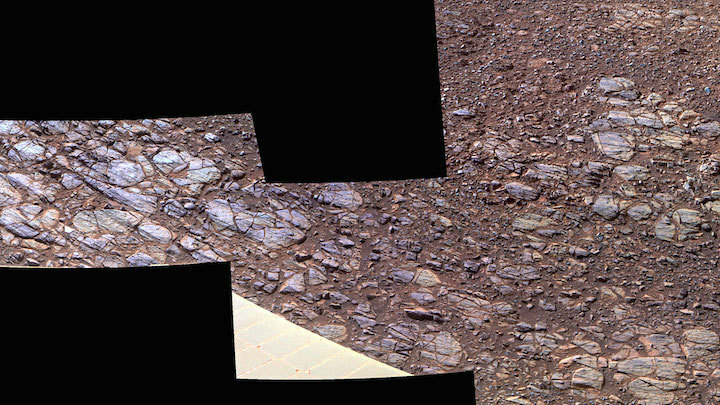 This enhanced-color view of ground sloping downward to the right in "Perseverance Valley" shows textures that may be due to abrasion by wind-driven sand. 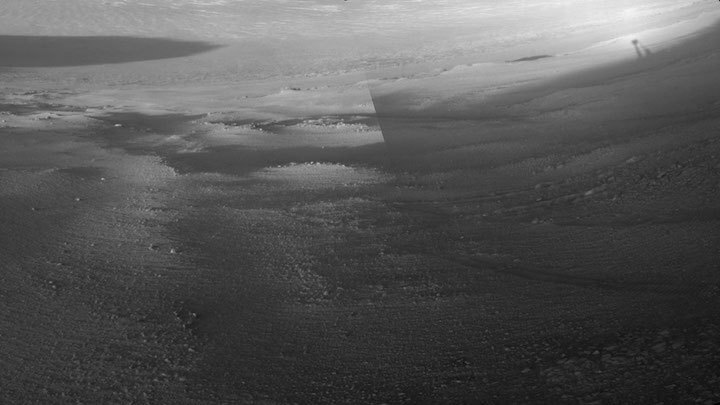 The Pancam on NASA's Mars rover Opportunity's imaged this scene in October 2017. Opportunity has not always been on such suitable terrain for winter operations. In its fifth winter, in 2011-2012, it spent 19 weeks at one spotbecause no other places with favorable tilt were within acceptable driving distance. In contrast, it kept busy its first winter in the southern half of a stadium-size crater, where all of the ground faced north. "We were worried that the dust accumulation this winter would be similar to some of the worst winters we've had, and that we might come out of the winter with a very dusty array, but we've had some recent dust cleaning that was nice to see," Herman said. "Now I'm more optimistic. If Opportunity's solar arrays keep getting cleaned as they have recently, she'll be in a good position to survive a major dust storm. It’s been more than 10 Earth years since the last one and we need to be vigilant."